We are super excited open up our dance community to new students this coming January! The accelerated session squeezes 5 parts into 3 parts, moving forward with the curriculum at a faster rate. This is a great opportunity if you missed our September 2018 launch or are just starting your journey with dance now! Acceptance - Our hearts are open to anyone who’d like to join us on the dance floor. We accept everyone exactly as they are as a person and a dancer. Individuality - We have students from age 19 to age 80+ within our company. Everyone shows up with their own goals and desires. We embrace the essence of you! Joy - We are all seeking more joy. Finding the things that bring about the greatest joy is vital. 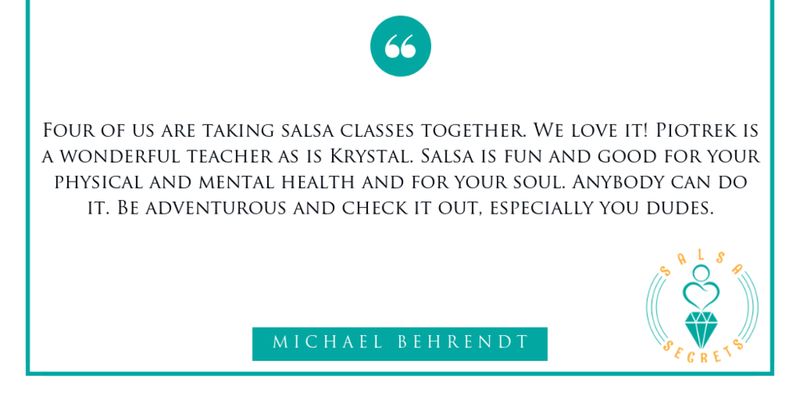 For many, salsa brings great joy and that’s what we encourage you to share on the dance floor! Technique - We offer the highest quality of technique to help you really become grounded in the dance. We believe that strong fundamentals are the key to any dance. Healing - We highly value the part of dance that takes us beyond the physical movement. Dance is transformative in every way and we are extremely passionate about sharing this with our students. Commitment - We are committed to supporting you through your process and meeting you where you are. We care about each and every student. Community - We are so grateful to have a beautiful community of dancers in Portsmouth and Newburyport and even online. Everyone within that community has been the beginner shoes before. This community is open and loving. We couldn’t have dreamed of more! Piotrek and Krystal have been dance partners and co-creators of Salsa Secrets for 4 years. With many years of dance training and teaching, they bring experience, fun and dedication to the dance. They are extremely passionate about teaching new level 1 students as they enter the company. Piotrek and Krystal are caring, loving and thoughtful individuals that are eager to support your needs as a new dancer. Packages start at just $120! CLICK HERE to learn more about our online Level 1 Complete program. You get one class, 90 minutes of instruction, for FREE!!! These very special package prices for Salsero/Salsera in the Making & Dance the Night Away are only available online with pre-registration! Class by class payments are permitted, but not encouraged at a rate of $20/class. Online classes are $60/part or $30/part with the purchase of the a full class series. Do I need any dance experience? This class is for the ABSOLUTE BEGINNER, no experience is required. Nope, singles and couples are more than welcome. As with most dance studios, street shoes are NOT allowed on the dance floor. Our Level 1 Package includes a pair of soft ballet/jazz shoes. These soft shoes are great to get started with. They will help you to get a sense of your feet on the floor and develop your weight shift. You are more than welcome to wear whatever feels comfortable to you. Some students wear yoga pants and others wear casual dress clothing. Many students find it comfortable to dress in layers. Our company is designed so that each level is one year of classes (September to June) split into five 6 week sessions. In the case of the accelerated program, the curriculum will progress a bit faster (January to June) and is condensed into three 6 week sessions. All levels will follow the same 6 week session schedules. What happens after Level 1? At the end of Level 1 in June, we become Level 2 in September. Our primary Level 1 group will remain in the same time slot each week. Our accelerated group will join the primary Level 1 from the previous year as they all become Level 2 together. What happens in the summer? The summer is all about fun! We offer workshops and lots of free events within the community including Salsa in the Park - Portsmouth! What is the structure of the individual classes? Classes are 90 minutes in length. We begin with a brief warm up, followed by footwork also known as shines. We then introduce the responsibilities for any given topic for the leader and the follower. Then we integrate those responsibilities into partnering. Do you have social dances? We have social dances the first Saturday of each month at our Portsmouth dance studio. Our salsa socials are open to the entire Salsa Secrets community. It is common to have beginners and advanced dancers at every social. Everyone who’s an advanced dancer today was once in your shoes. We encourage everyone to dance together! Where is your dance studio? Our Portsmouth dance studio is located at 2800 Lafayette Road in Portsmouth. This is the plaza with the Beach Plum Restaurant. The studio is located in the center of the strip malls where the two wings of the building meet. This space is share with Jubilation. When you pay for your package in full, you get one class for free, which means, if you miss one, you don’t lose a penny. Is Level 1 Salsa necessary for me? Even if you have some dance experience with another style of dance, we still recommend taking Level 1 Salsa, as the language of movements is different from other styles. Your relationship with dance isn’t a sprint, but rather a marathon. There are always details to work on. If you still think you belong in another level, let us know and we will talk about possibilities. What happens if I have dance experience, but my partner doesn’t? It’s wonderful that you are already dancing and your partner is interested in joining you. The last thing you want to do is overwhelm your partner and prevent them from wanting to come back. It’s always best to start at the level that makes the partner with less experience most comfortable. You will continue to progress and develop the fundamentals of your technique. How long before I am dancing well? The only difference between you and an advanced dancer is MORE REPETITION! On the very first night of class, you will be dancing. The more you enjoy that sensation of dancing and the process of developing as a dancer, the better your experience! The opportunity that lies ahead, connecting all the parts of our being - physical, emotional, spiritual and intellectual. Feeling the presence of the moment, engaging in the possibilities and experiencing true joy!